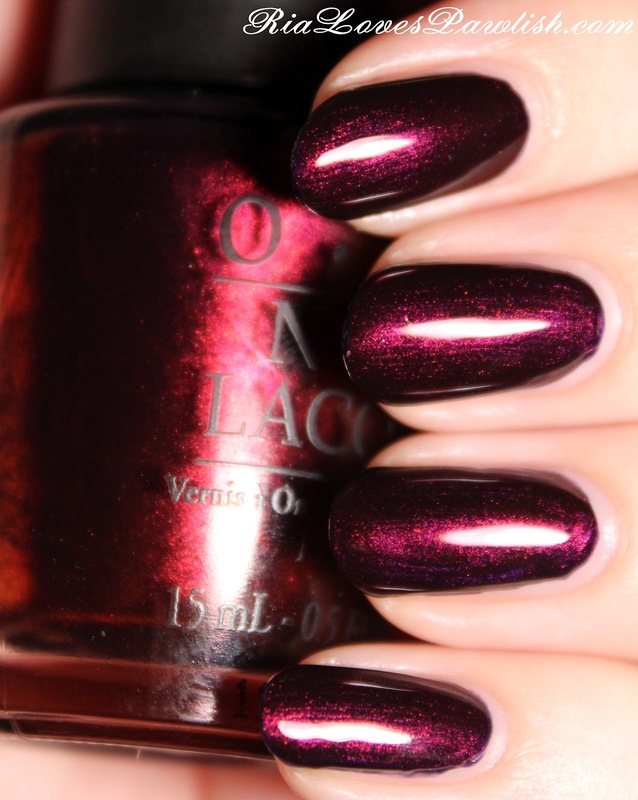 today's polish is the crown jewel of the OPI Germany collection, Every Month Is Oktoberfest. in the bottle it looks alarmingly like German-icure By OPI, i actually at first thought i had been sent two of the same polish! (i'm so glad it was right, i hate dealing with the private sellers on Amazon when something goes wrong!) Every Month has the same red shimmers, but where German-icure has a chocolate brown base, Every Month is a deep purple. it is absolutely stunning, chic for every occasion. this is a perfect Fall color... this whole collection has been really great with bringing out seasonal colors! the formula on Every Month is great, two easy coats for full opacity! i would add an extra coat of topcoat to really make your nails look like glass and bring out all of the shimmers in the polish. two coats Every Month, two coats Seche Vite. :D i really love it!! :) sorry for the double post! Looks great on your hands!